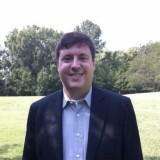 Will Allen, Chapel Hill. Claire Robinson, Los Angeles. Mike Houck, Portland. In winter 2009, Houston Wilderness hosted an inaugural meeting of what would become the Metropolitan Greenspace Alliance. Today the Alliance is a national coalition of coalitions working in ecologically, culturally, and economically diverse communities across the US. Alliance members represent Portland, Oregon; Seattle, the San Francisco Bay Area, Los Angeles, Houston, Chicago, Milwaukee, Cleveland, Nashville, St. Louis, Kansas City, Denver, and Baltimore. Over 80% of the population in the United States now lives within urban megaregions, and this trend of rising urbanization is similar in countries around the world. Amidst significant investments in “grey” infrastructure to support growing metropolitan regions, conserving nature is increasingly challenging. And, more often than not, the most significant challenge is protecting and restoring natural systems that provide clean air and water and other ecosystem services that nature provides us. 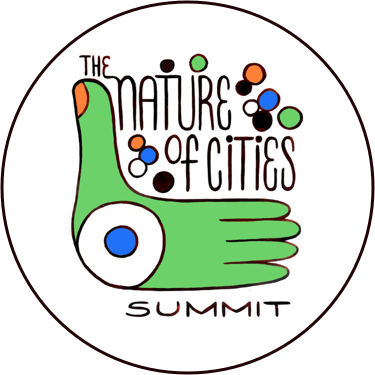 Metropolitan regions that effectively incorporate greenspace and Green Infrastructure into their urban fabric share several things in common, often including ample parks and natural areas, both in quantity and equitable distribution; innovative stormwater management; climate adaptation strategies; public transportation and recreational trail networks; and sustainable food production and delivery systems. Whether it’s Vancouver, Reykjavík, Malmö, Portland, or any number of cities around the world that are “green” or in the process of “greening,” the collaboration among governments, nonprofits, scientists, natural resource agencies, and urban planners is essential to transform a place from grey to a green, living, interconnected network of systems that benefit humans and the unique urban ecosystem they inhabit. 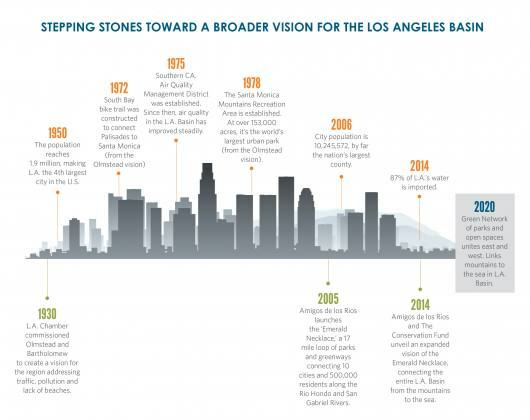 The following case study from Metropolitan Greenspace Alliance member Amigos de los Rios describes an almost century-long process of Los Angeles’ greening that should inspire other cities and metropolitan regions toward a greener future. The struggles faced and overcome are not unique to Los Angeles. This story is a glimpse into how universal urban sprawl and development are and the importance of incorporating Green Infrastructure principles into local and regional urban design. 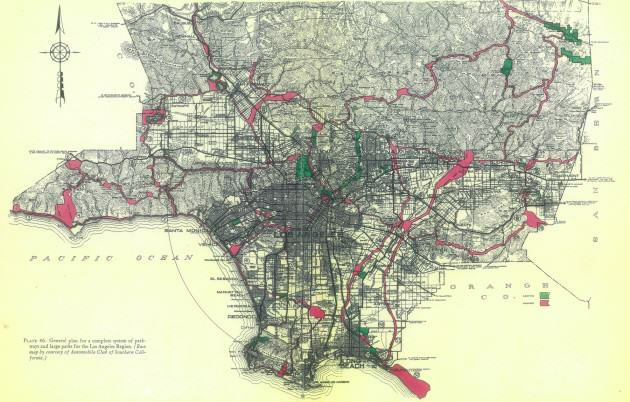 In the late 1920s, the Los Angeles Chamber of Commerce commissioned two highly-regarded landscape architecture firms to create a vision for the region. Leaders became deeply concerned that traffic, air pollution, overpopulation and a lack of access to parks would harm the area’s future. Two firms—Olmsted Brothers and Harland Bartholomew & Associates—crafted a prescient plan focused on addressing a scarcity of playgrounds and parks, as well as burgeoning traffic, air pollution and a population rapidly swelling to over two million. The plan wasn’t adopted, and today these challenges have grown exponentially as the county’s population surges beyond 10 million and the natural landscape is dramatically altered to meet the needs of more residents. Los Angeles County spans 4,000 square miles and is home to 88 cities and more than 10 million people. Instead of capitalizing on its unique assets of ethnic diversity and picturesque geography, though, the county is cut off from itself. Between mountains and forests to the north and east, and beaches to the west, infrastructure is grey, freeways are gridlocked and quality of life is uneven. There’s no other place in the United States quite like it; Los Angeles County on its own would be the eighth most populous state in the U.S. and the 88th most populous country in the world. The valley holds nearly one-quarter of California’s population and is one of the most ethnically diverse places in the nation. Its geology is unusual too. Framed by mountains and forests to the north and east, and beaches and oceans to the west, its interior is dominated by grey. Large-scale infrastructure supports a vast population, resplendent with gridlocked freeways, bustling ports, paved riverbeds, and concrete irrigation channels. In the city of Los Angeles alone, average life expectancy differs by 12 years from the lowest-income portion to the highest. Countywide, only 36 percent of children live within one-quarter mile of a park, compared to 85 percent in San Francisco. 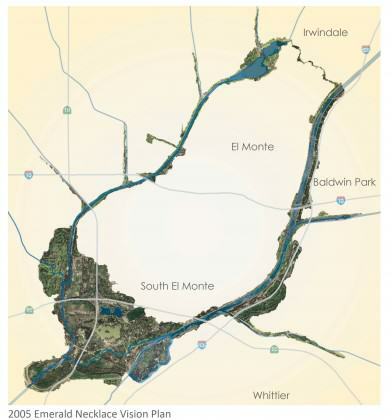 In 2005, Amigos began planning and designing a 17-mile loop of parks and greenways (often underutilized spaces owned by public agencies) along the Río Hondo and San Gabriel Rivers on the east side of Los Angeles that would connect nearly 500,000 residents. The plan’s parks and greenways provide desperately needed recreational areas for communities suffering from extreme density and urban decay, and the associated social and health issues. As part of this effort, Amigos has helped convene the Emerald Necklace Coalition, comprised of 62 member agencies with a connection to East Los Angeles. All Emerald Necklace Coalition members have signed the Emerald Necklace Accord, a legal document that pledges its signatories to work collaboratively to preserve and restore the Los Angeles and San Gabriel watersheds and their rivers and tributaries for recreational open space, native habitat restoration, conservation, and education. 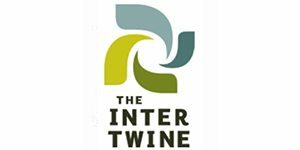 In 2008, the vision was expanded to help unify a vast region of Southern California, from the desert through the San Gabriel Mountains to the Pacific Ocean, by linking more than 1,500 acres of parks and open spaces along an interconnected greenway around the Río Hondo, San Gabriel, and the lower Los Angeles Rivers. 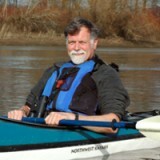 In 2012, Amigos de los Rios commissioned The Conservation Fund to take a fresh look at how to design and use Green Infrastructure to reconnect people and wildlife with the county’s lands and waters. Over the course of 18 months, the Fund worked with Amigos to convene focus groups, synthesize existing plans, analyze mapping data, and evaluate implementation strategies across the county. The Fund found that despite the significant alteration of the natural landscape over the past century, many of the core recommendations of the Olmsted-Bartholomew Plan are as relevant today as they were in 1930. 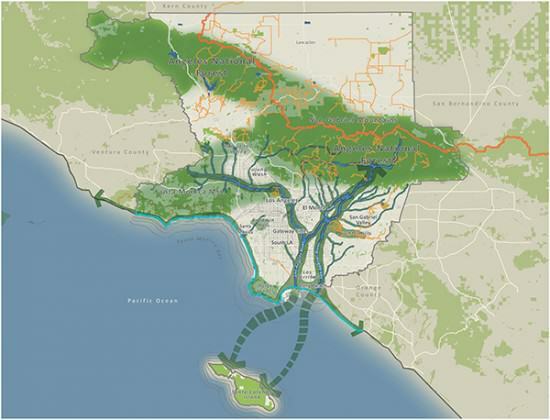 The Emerald Necklace Forest to Ocean Expanded Vision plan, released just a few months ago, has created a contemporary vision—calling for a strategically managed and interconnected network of parks, rivers and lands, designed to re-create Los Angeles County as a better place to live, work and play for decades to come. Amigos and The Conservation Fund hope this ambitious expanded vision is a blueprint to unite the county. 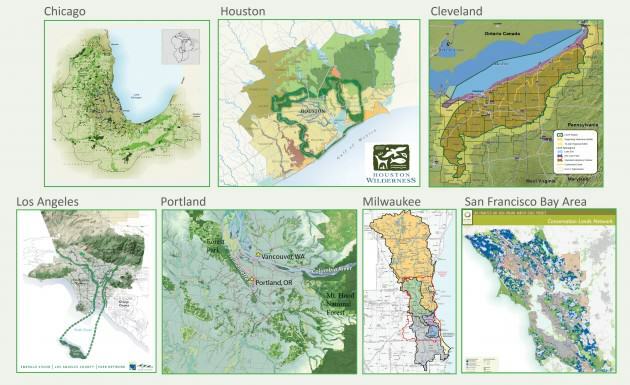 Rather than starting from scratch, it integrates common elements from existing plans and outlines specific implementation strategies to create a network of parks and public open spaces connected by greenways and trails. The plan focuses on eight mutually-reinforcing goals under a common vision. In addition to increasing access to a network of equitably distributed transportation—walking, biking and riding trails—it recommends the creation of functional and multi-purpose natural (“green”) and built (“grey”) spaces. The plan addresses the region’s critical water supply, identifying key recommendations to improve how this vital resource is managed to protect local water quality, and assure ample water supply. The plan prepares communities to be resilient to inevitable effects of climate change, which can be fostered by a community-wide culture that embraces the benefits of conservation, restoration and recreation. Regional wildlife and natural area “anchors” will be enhanced and restored. Finally, the Plan aims for a robust and durable economy where jobs are created that support the multiple benefits of green infrastructure. Despite the very clear collaborative priorities and strategies outlined in the plan, the key to lasting success will be if the plan is able to instill “a fierce sense of urgency” among the many partners in Los Angeles County that are needed to make this a reality. The plan encourages cities, counties, school districts, water agencies, public health and environmental groups to put a human face to infrastructure and accelerate improvements now for the benefit of Los Angeles County residents and its collective health. 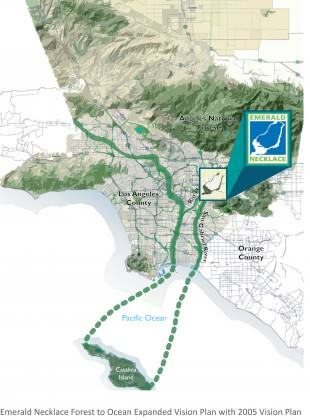 The Emerald Necklace Forest to Ocean Expanded Vision Plan for Los Angeles County, California is available for download here. 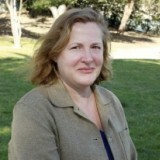 Claire founded and serves as Managing Director of Amigos de los Rios. Her approach has led to Amigos de los Rios unique success in creating beautifully designed, culturally relevant green infrastructure in open spaces. Thanks, Ronaldo. Good observation. We certainly did not consciously omit a Boston reference for the article but one can infer a lineage back to that plan through the involvement of Olmsted in the L.A. plan. The full L.A. Expanded Vision Plan references the Boston work in some detail on page 5. Fascinating! But how come you don’t even mention Boston’s Emerald Necklace in your article?